Hello! My name is Shungo Hayashi, and together with my wife Kana Hayashi, we are the owners of Kanazawa Guesthouse. I’m originally from Kanazawa in Ishikawa Prefecture, though I had been living in Nagoya until March 2016. 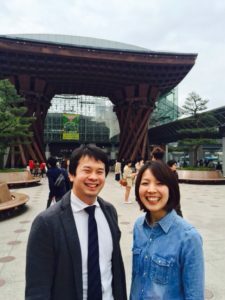 Last spring, I quit my job as a teacher, and decided to make a U-turn back to my hometown of Kanazawa with my wife Kana. It was a big decision to make, but my feeling of wanting to do something in Kanazawa for Kanazawa, and my desire to create a guesthouse where I could share the charm of Kanazawa, continued to grow stronger and stronger. As such, I decided to return home in order to make those desires a reality.